GC36 delegates congregate at the Aula for morning prayers. Joaquim Francisco da Sarmento, S.J., leads the morning prayer. Pope Francis’ exhortation to the members of GC 36 encouraging us ‘to ask insistently for consolation’ stirred and confirmed me. This bring me back to a graceful moment when I found that ‘God is never pretending to me’. He always gives me ‘His Cross’, He also always gives me ‘His Resurrection’. I had had many experiences of the Cross in my close family: when my younger sister suffered from heart problem – and then from of syndrome that led to kidneys failures – and, in my larger family, when I lost my uncle in a motor car accident, and later when I lost my brothers. Yet, God also gave ‘Resurrection’ to my family, to myself. In all this I learned: those were and still are ways through God leads me to experience ‘Consolation’ of the Risen Lord. Pope Francis invites us to live our Spiritual Exercises lively. To ask insistently for consolation is to ask insistently for courage to shoulder His Cross with Him, with our brothers and sisters suffering from all kinds of difficulties. When I visited my Jesuit brothers working in Papua, I found great consolation seeing their courage and zeal in mission. Working in one of the most remote and underdeveloped frontier, our Jesuit companions experienced real Joy, real consolation. They shoulder Christ’s Cross in our times, opening a future to so many smart yet unfortunate children who were lacking proper education opportunities. They walk with Christ who, in this modern era, is walking slowly with Indigenous People crushed by the running world in their daily life. This daily Cross was in fact a space, a seed of interior Joy, an anticipation of deep consolation of seing educated young people ready to share their gifts for others. Not one of these Jesuits was having regrets of having been missioned to this frontier. Everyone experienced the deep consolation, the interior Joy – the fruit of what they insistently ask: to shoulder His daily Cross. 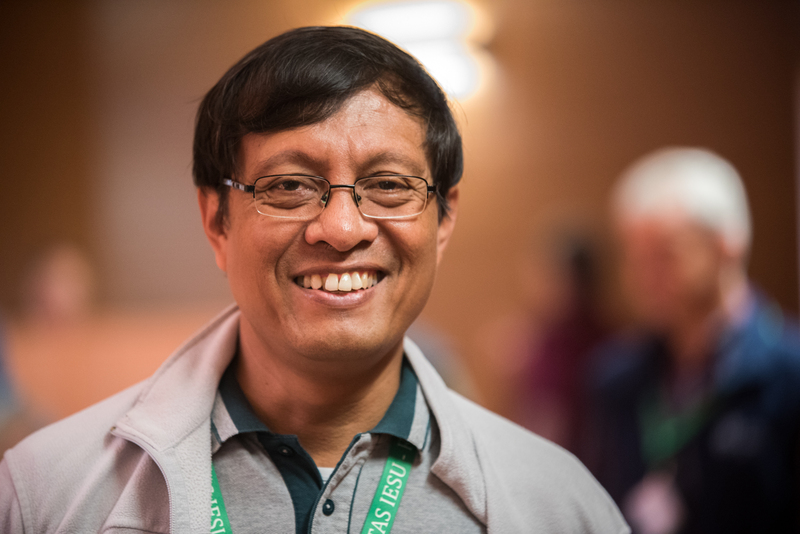 The similar Joy was also experienced by so many friends of Jesuits working in our schools for the poor, the parishes and our spirituality centre, in our colleges, universities, and many kinds of apostolic works such as the Jesuit Refugee Service (JRS). The suffering of the refugees –especially the children – being detained in the Immigration Centre moved JRS’s staff and volunteers to offer simple yet relieving help. Accompanying children to learn how to read, supporting those who suffered from great desolation and desperation, and to be with them has become moment of grace. They shared their deep sorrow, they shared their deep hope. A friend of mine told me, once I was in deep sorrow: “Sunu, follow that feeling, because that feeling is real”. Yes, the sorrow of shouldering His daily Cross is the space, the seed of inner Joy, of deep Consolation. To ask insistently for consolation is to ask insistently to shoulder His daily Cross joyfully. The consolation of sharing the Joy of the Risen Christ is the fruit of sharing shouldering His cross in our life and ministry. Let us be grateful to our beloved Pope Francis who invites us to ask for consolation so that we could promote Joy: Joy to all people, Joy to the earth.